The Fred. P. Wilken Training Center was dedicated in September 2003 for its founder, Fred Wilken. It is a non-profit training center that features EMT Basic and Refresher courses, CPR courses, and Defensive Driving courses. 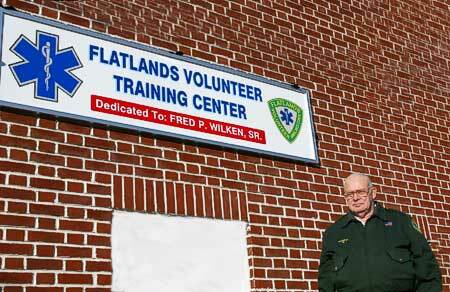 Fred has served the Flatlands community with distinction for 30 years now, including as our Training Officer from March 1991 to December 2004. Fred has also served as First Lieutenant, Quartermaster, Safety Officer and on FVAC’s Board of Directors. A sincere Thank You" to Fred for his dedicated service. Then FVAC Training Officer Fred Wilken stands proudly before the sign commemorating FVAC’s Training Center in his honor. The sign was unveiled in September 2003.